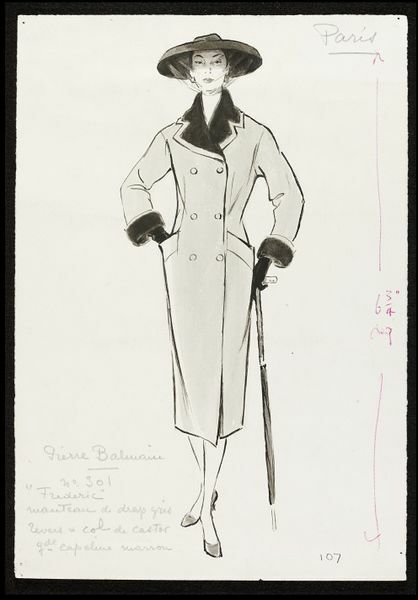 Fashion drawing by Marcel Fromenti based on a design by Pierre Balmain of Paris for a winter coat with a beaver fur collar. It was intended as an illustration in The Lady. The Lady was small rather than glossy. It mainly concentrated on publicising day dresses which would have been more suitable in style for the majority of women of the time. Its engaging style that explained in simple terms the fashion developments of the day contributed greatly to its popularity. 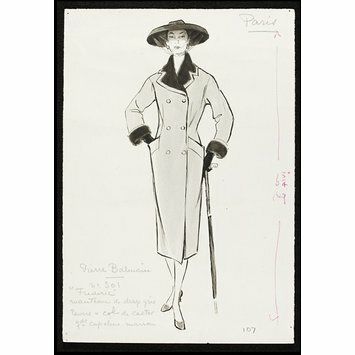 Fashion drawing based on a design by Pierre Balmain of Paris for a winter coat called "Frederic" with emphasis on the new beaver fur collar. A woman standing full face wearing a deep grey wool double-breasted coat with beaver fur collar and cuffs, slightly fitted at the waist and narrowing at the hem. The design, by Pierre Balmain of Paris, is called "Frederic". She wears black gloves and a wide-brimmed hat with a face veil, and carries a tightly furled umbrella. Pencil notes give designer, fabric and colour notes. Marcel Fromenti. 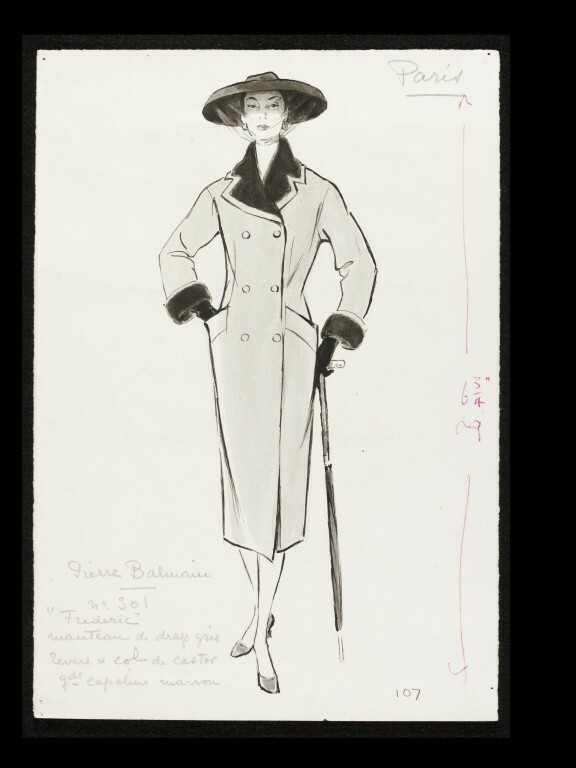 'Frederic' coat by Pierre Balmain. For The Lady, 1953-54.